Started this year, students have to sign out instead of using their iPads for passes. Photo by Scott Gerrits. In the twenty two years D.C. Everest Senior High has been opened, there have been many changes made to it. 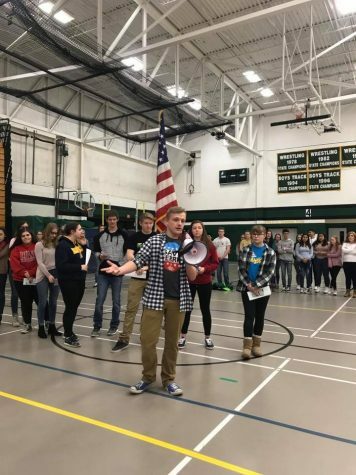 Some of which was to make learning easier, some due to dislike, but the most is from the feedback from the student body. In many cases, this is a good thing, there are some things would like to change. One of the most noticeable changes that the school has made is the student pass system. 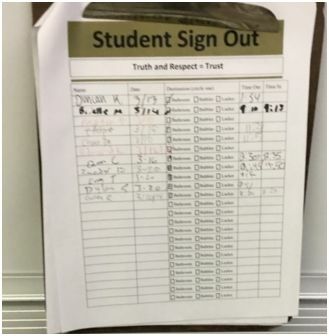 Instead of using electronic passes on the iPads students received, they now sign out like they did in elementary schools. Granted this may have one or two major flaws, but it is effective and much simpler. Another less noticeable change is that teachers have easier up on the rules. This has many problems to it, but if you wish to know more about it, you’re going to have to read the March issue of the Jet. However, this thing has gone a long way for many who do not abuse it. There are many more changes that the school has made, but those are the ones that students notice the most. For all the suggestions that students make for changes, there are more that still need to happen. However, there is a understanding why few of these haven’t been touched at all. One of the suggestions that has been put forward by many is a longer ELT period. Reason why this has been put forward is due to the amount of homework that teachers bombard students with daily. This would enable students to get more work done in a efficient time frame than a 45 minute time frame. The next suggestion that ties back into the last one is rotational block days. The most often complained topic in the hallways and lunch room is normal school days. As mentioned, students often complain about how much homework is given to the students on a daily basis. With so little time in or out of school for some, this hinders their ability to get most, if not, all of their work done. What people have suggested is that students and teachers rotate between Block one and Block two days weekly. This idea came from the middle school, who does their daily schedule. While people complain about block scheduling, it would benefit a lot of people in terms of finishing their work. Two other suggestions have been more tables, less desks, and an open campus. Most people who have classes with tables and less desks would agree that it is better than having desks. While this is a good suggestion for the school to look into, the other one is not one that will be happening anytime soon. Having open campus will never happen in the D.C. Everest district, for numerous reasons. One being, student safety. In the past few months, there have been 19 different school shootings. The school district simply cannot dismiss the fact that 23 students have been taken before their time. No one in the district ever wants to see what happened at Douglas High ever happen here or anywhere else. Setting aside the harshness we call reality, there is a suggestion that has every teachers attention. The teachers will be getting together to see if they can make a small time period in the morning so students do not burn up their ELT time. The discussion for this will be happening soon and all goes well they might try it before the years over or next year. Another officer in the building is something that every student can agree upon having. Knowing that Officer Frank is not always in the building does trouble some of us, after last year’s rampage. We would feel safer if there was one or two officers in the building. Their may have been many suggestions that have not been spoken of in this article, but they have not been unnoticed. It is always important to give your feedback to teachers and keep making suggestions. You never know what the school will change next.